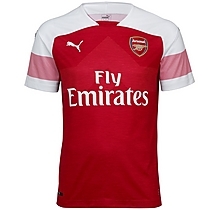 The Arsenal Women's 18/19 Short Sleeved Home shirt has a refreshed new look, whilst retaining the iconic red and white colours that are synonymous with Arsenal Football Club. The main body of the shirt features a marl-effect fabric panel with a diamond-cut pulse design running through the middle, and red pin-stripes set upon the contrast white sleeves. The A-symmetric style of the shirt will not ride up when arms are raised, and breathable side panels allow for a more comfortable fit whether worn for exercise or casual wear. The Puma dryCELL technology of past shirts is a feature here too which works to draw moisture away from the body helping to regulate temperature and keep you dry. 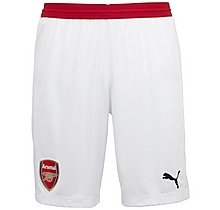 Why not make it your own by having your chosen name and number printed on the back?